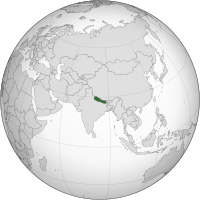 Nepal is a landlocked country in Asia. It borders India and China. It is located in the Himalayas, which is why the country is rocky. It is home to the tallest mountain in the world, Mt. Everest, called Sagarmatha (सगरमाथा) in Nepali. This page was last edited on 6 June 2016, at 15:10.